LiveCode LessonsLiveCode LessonsHow To - LiveCode Mobile Tasks iOS TasksHow do I read/write to files on Mobile? 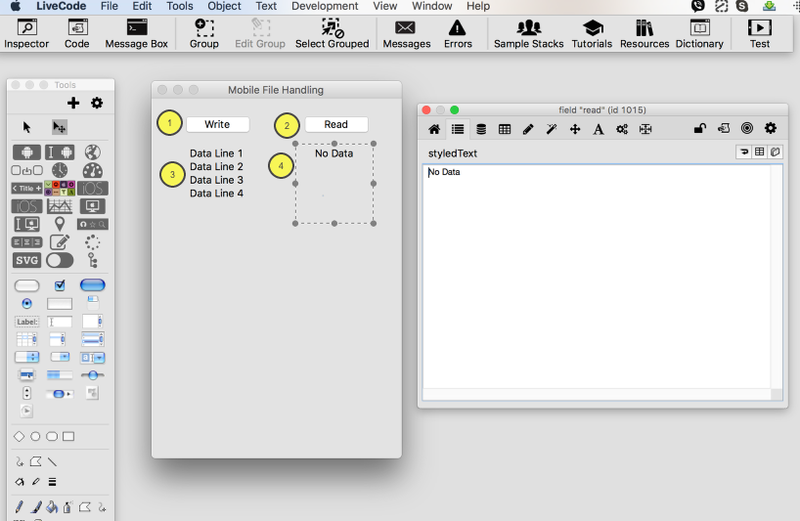 This lesson looks at how to create a file and then read/write data to it. This has many practical applications from storing user settings between sessions to high score tracking. The sample stack we'll build together will be configured for the iPhone, but these principles will work for all the other mobile platforms - and indeed for desktop, if you want to write one block of code that works across all platforms. Our stack is now setup and we can move one to coding this example. Mobile deployment imposes strict controls over what you can and cannot access. Each application in mobile is stored in its own 'sandbox' folder (referred to as the home folder.) An application is free to read and write files within this folder and its descendants, but is not allowed to access anything outside of this. When an application is installed on a phone (or in the simulator) a number of initial folders are created for use by the application. You can locate the paths to these folders using the specialFolderPath() function. home – the (unique) folder containing the application bundle and its associated data and folders. engine – the folder containing the built standalone engine (i.e. the bundle). This is useful for constructing paths to resources that have been copied into the bundle at build time. This will be different for every user. It will also change depending on your platform. LiveCode will return the default location for documents on whichever platform your application runs on. 1) Build the full path to your file every time you want to access it. Now, whenever you look to perform a Read or Write it will be done relative to the documents folder. 1) Drag on a new button. Name it "Write"
2) Drag on a second button. Name it "Read"
There are various ways to read and write to files in LiveCode. You can 'Open' a file and then 'Read' or 'Write'. For smaller files I prefer to use the URL command. It allows us to simply 'Put' our data in the file. If the file you specified doesn't exist LiveCode will create it for you. If you are writing binary data to your files your should use "binfile:" instead of "file:" before your filename. put URL ("file:test.txt") into field "read"
Prev: How do I make a phone call on the iPhone? 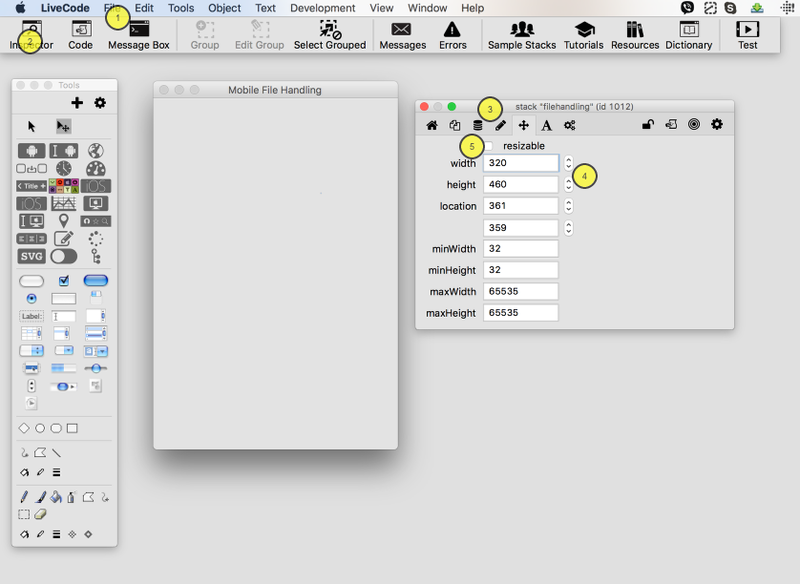 Next: How do I Send HTML E-Mails with Attachments in iOS? Please see my forum post if you are trying to copy a file from your application folder to another folder for write purposes (in my case I was shipping a database file that I had to move from the app folder which is read only to the Documents folder on an Android device). How do you list the file names in the documents folder? You can use the function "the files" to list the documents in the defaultFolder. Is it wise to try to change the old Mac rev- stacks for iPad, or rewrite them? For the iPad - I need to create a series of tables with relationships between these tables. How is this done and how can I ensure that these tables are backed up using the 'iCloud'. you could use SQLite to create a database on your iPad. Look at this lesson for further information on the topic: http://lessons.runrev.com/s/lessons/m/4069/l/30516-how-to-create-and-use-an-sqlite-database. If you write files to the "documents" path, then the content is automatically backed up, as long as the user has set permissions for this to happen. Have a look at the dictionary entry on "specialFolderPath" for more information on this. I can use the specialfolderpath when designing the app on my mac, but when I run the simulator or move it to my phone, it can find the file. Do I use "documents" or home for writeable file with a Iphone app? it depends for what you want to use the files you are saving on your iOS device. If they are only temporary files that are used during the execution of the application, then use the "temporary" path. If the files are to remain accessible for each launch of the application, then use the "documents" path. This is where application specific information is stored that is also backed up by iTunes. Is it also possible to create a specific folder within the documents folder? No problem on the osx side, but does this also work on the iOs side? sure, you can create folders within the documents folder. Have a look at the dictionary entry for: "create folder". Article says: "Mobile deployment imposes strict controls over what you can and cannot access. Each application in mobile is stored in its own 'sandbox' folder (referred to as the home folder.) An application is free to read and write files within this folder and its descendants, but is not allowed to access anything outside of this." Might be true for Apple devices but you can write files to the outside file system on Android. Hi Jim, thanks for your comment. This is a good point, I just wanted to add that if you want to write files outside the apk bundle on Android you need to ensure you check the "Write External Storage" option in the Android Standalone Application Settings. Is this case sensitive? if so which should be used "Documents" or "documents"? Hi Ewan, it is not case sensitive but having checked the documentation for the specialFolderPath() function I would suggest using "documents". I have update the text of the lesson for consistency, thank you for bringing this to our attention.